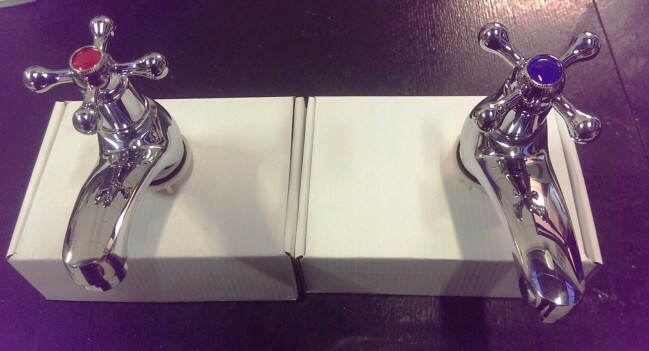 BEAUTIFUL STRONG AND QUALITY BASIN TAPS HOT AND COLD STANDARD UK FITTING BRAND NEW IN TWO SEPARATE WHITE BOXES BUT POSTED TOGETHER ALSO WRAPPED FURTHER IN A WHTE SOFT BAG INSIDE (YOU GET A PAIR, HOT AND COLD COMPLETE SET) SHINY SPARKLING CHROME AND SUPERB QUALITY THESE ARE NOT THE CHEAP FLIMSY BRITTLE TINY TOY TYPES THEY ARE LONG LASTING STRONG QUALITY TAPS! FREE UK POSTAGE! WE WILL POST OUT FIRST CLASS WITHIN 24 HOURS!